Margaux Mustian, left, and Laura Hickman, right, say they pursued a career in transplant surgery in part due to the teaching and training they received from longtime UAB transplant surgeon Mark Deierhoi. 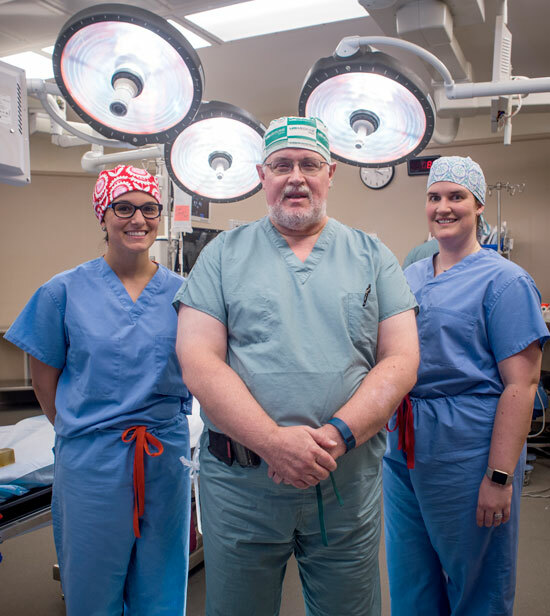 The general surgery residents in the University of Alabama at Birmingham Department of Surgery who have trained with transplant surgeon Mark Deierhoi, M.D., director of UAB’s Renal Transplant Program, marvel at many things about one of their most influential surgical teachers. They laud his attention to detail, his diligent instruction, his enthusiasm for resident education — even his knowledge of music and movies, which residents say is quite impressive. But the one word they often use to describe Deierhoi? General surgery residents — a group that includes Mustian and Hickman — recently honored Deierhoi with the Kirby I. Bland Surgical Faculty Teacher of the Year award. It is part of a set of faculty awards given annually at the General Surgery Residency Graduation Chief Dinner. Deierhoi, who has performed more than 2,200 kidney transplant surgeries in his career, trains general surgery residents early in their careers. The fact that they would honor him when he is several years’ removed from teaching most of them came as quite a surprise, he says. General surgery residents honor three faculty with awards, given annually at the General Surgery Resident Graduation Chief Dinner each summer. Kirby I. Bland Surgical Faculty Teacher: Mark Deierhoi, M.D., director of UAB’s Renal Transplant Program. Marshall M. Urist Junior Faculty Teacher: Sushanth Reddy, M.D., assistant professor of surgical oncology. Non-surgical Faculty Teacher: Benjamin Tuck, M.D., assistant professor of cardiothoracic anesthesia. Deierhoi says he draws from his own experience as a trainee learning the surgical ropes when it comes to how he trains residents. His training as a resident, he says, was not ideal. “My residency was not the greatest residency for teaching surgical technique,” Deierhoi said. “There wasn’t a lot of real close mentorship, and I didn’t really appreciate what a good teacher could do until my fellowship. The people who taught me in my fellowship were masters, and I learned an enormous amount from them. Mustian and Hickman say the impact Deierhoi has had on their surgical education has been tremendous. Both of them chose to pursue transplant surgery in large part, they say, because they crossed paths with him. Hickman says seeing how everyone who interacts with Deierhoi responds to him is very telling of both the type of person he is and the type of surgeon he is. Deierhoi is also one of four UAB transplant surgeons to perform transplants as part of the UAB Kidney Chain, the longest kidney transplant chain in the world. To date, 74 kidney recipients — 148 total surgeries including donor surgeries — have been transplanted as part of the chain, which is scheduled to pick back up again this month. If you are interested in becoming a living-kidney donor, visit uabmedicine.org/kidneytransplant. To indicate your interest in donating your organs after death, visit www.organdonor.gov and sign up today.